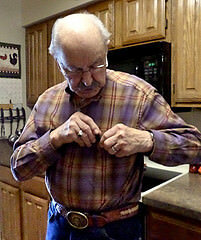 Low vision lighting can help you see details clearer and reduce your need for magnification. Lighting needs increase as you age and especially for those with dry or wet macular degeneration. The right lighting can make a big difference in your ability to read, enjoy a magazine or perform a hobby. Sometimes it's the simple things that can really make a difference in our lives - and providing good lighting might just be one of those simple things that you can do to make a huge difference. Lighting is not only important for near vision tasks, but also for safety and for getting around your home with better visibility. One recent change we made in our own home was to replace a floor lamp that had a dark shade and low wattage. The new lamp has a white shade and has two bulbs rather than one. The lamp features a 3 way switch which provides a maximum light bulb wattage of 150 watts. It is a much better and brighter light for our living room. Many people find it helpful to put some lights on timers so that as it gets dark, rooms or hallways are automatically lit. 1. The halogen torchere lamp provides the best brightness for overall room light. 2. A gooseneck adjustable floor or table lamp is best for detailed work. With this lamp you can bend the lamp to a position that directs the light to exactly where you need it. There are also clip on models so you can place one almost anywhere. 3. Get lamps that offer 3-way lighting. That way you can increase the lighting up to 150 watts for reading. 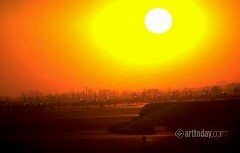 For some people allowing as much sunlight into their home is helpful while others need to filter it because their eyes have become light sensitive. For those who benefit from a sunny room, use it to do certain tasks like crossword puzzles, writing checks, or reading. Place a chair near a window for daytime reading. Natural sunlight for reading can be helpful for some but not for everyone. Put your chair with its back against the window so that the sunlight falls onto your book or project. For those who are light sensitive, window shades that filter sunlight can help light up a room but reduce glare. Many people are aware of the dangers of ultra-violet light, but unaware that another spectrum of light, called blue light may also impact the health of one's macula, especially those that have macular diseases or at risk for them. 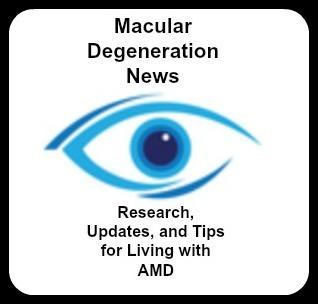 Dan Roberts, the Director of www.MDSupport.org and author of The First Year: Age-Related Macular Degeneration: An Essential Guide for the Newly Diagnosed , shares with us ow blue light affects the retina and how to protect your eyes from its damage. Use the brightest light bulbs recommended for each light fixture. There are severa different kinds of light bulbs. Halogen bulbs cause less glare but they can be too hot for some lamps. Just like the fluorescent bulbs, halogen bulbs can only be used in halogen lamps. As a desk lamp, they do provide the best "brightness." Many of the torchere lamps are halogen lamps and provide better low vision lighting to a room. This lighting enhances color and contrast and mimics sunlight. However, some eye specialists warn against using full spectrum lights because it contains blue light which is known to cause damage to the retina. Peggy Wolfe the author of Macular Disease: Practical Strategies for Living with Vision Loss suggests "Look for a lamp that comes with a halogen bulb if you want really strong light." A halogen desk lamp provides bright task lighting for those with macular degeneration. Halogen bulbs are brighter than regular incandescent or LED light bulbs which is why many people with macular degeneration (AMD) prefer these bulbs for their task lighting - for doing things like reading bills, writing checks and performing hobbies. The need for light is greater because of the degeneration of rods and cones in the retina. In fact some eye specialists state that those with AMD need four times more light than those with normal vision. It is important that you use an adjustable lamp, like this gooseneck one, so that the light can be directed onto your reading material or your hobby. Position the light so that it is directed or aimed right at your project or reading material. Often times with better illumination the need for magnification is less. Many people find that this type of lighting also enhances contrast. Please be aware that halogen desk lamps can get very hot. The instructions will tell you not to leave the lamp unattended and do not place it near anything that is flammable. You may have to experiment to find the type of light that works best for you. A gooseneck floor lamp can be placed next to your favorite reading chair or close to your bed for better lighting while reading. This lamp uses a crisp white LED lighting which means you'll probably never have to replace the light bulb. The benefit to this type of bulb is that it doesn't generate heat and stays cool to the touch. Another nice feature for this lamp is that the light switch stays lit as a mini-night light, so that the light switch is easy to find. Light that can be directed onto your reading material or hobby will help you continue to do the things you enjoy. Either an adjustable arm or a gooseneck will make it possible to position the light in a way that brightens up your reading page or task. Less magnification is needed when task lighting is used. The closer the light is to the object or material the better the illumination. The farther the light is from your task, then you'll experience less lighting and lower visibility. A few inches can make a big difference. At one of our visits to see my father-in-law who has wet macular degeneration I was surprised to see that there were no swing arm or goose neck lamps. Just regular table lamps or overhead lighting were his sources of light. There are several styles of swing arm desk lamps - desk lamps that can be used in the office or as clamp on lights for the garage, work bench or hobby table. If you are still having trouble seeing with better lighting and correct positioning of the desk lamp, then consider a swing arm magnifying lamp - a lamp that provides light and magnification. The mounting clamp on this light is very sturdy while the swing arm provides many different adjustable positions to make it possible to do detailed work with less eye strain. A clamp on light can be used at your desk, work bench or craft table which means it doesn't take up any valuable space. The LED lights last thousands of hours so there is no need to replace the bulbs.You can adjust the brightness with the tap of your finger to get the right lighting for your hobby or reading. It has a 5" diameter glass lens and the arm can be positioned in any way that's needed. 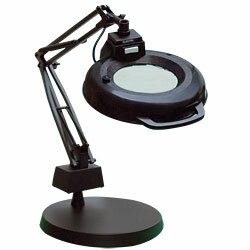 A floor lamp magnifier is a great visual aid to have for reading or for hobbies like sewing. Set it next to your favorite chair and enjoy reading again. 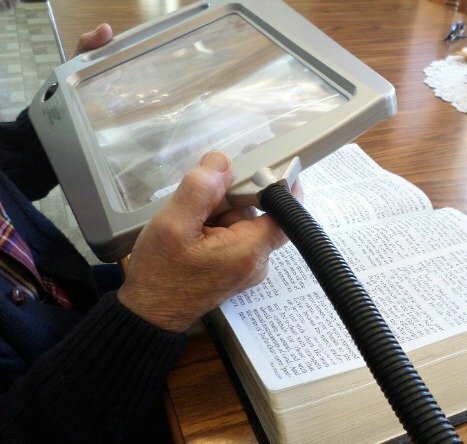 This lighted magnifier features 12 LED lights and a large, full page size magnifier that measures 8" by 10". 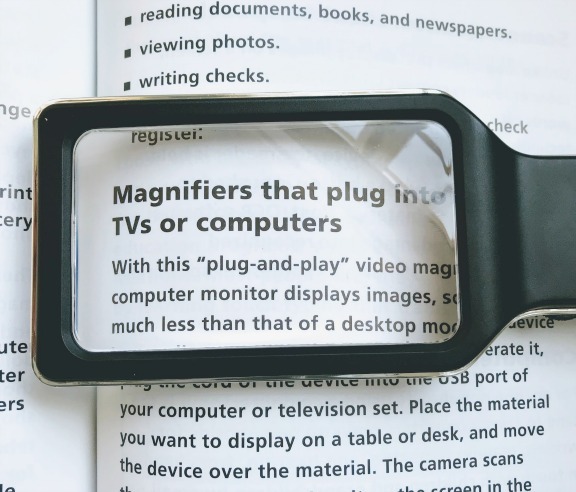 Combine that with 3X Magnification and you will find this combination may give you the light and magnification that is needed to enjoy your favorite books, newspaper or magazines. 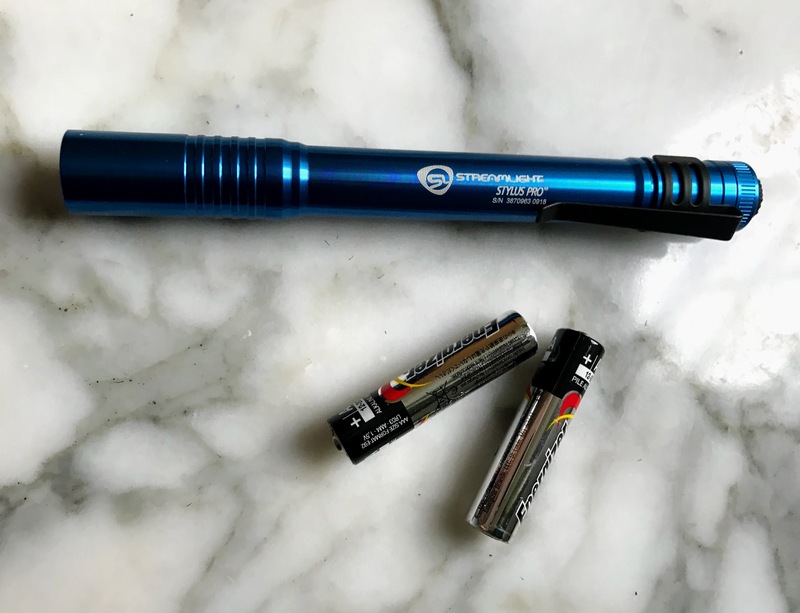 My father-in-law who has wet macular degeneration won't go anywhere without his pen flashlight. There is nothing like taking "light" with you wherever you go. He uses it to help read a menu in a dark restaurant, check the buttons on the microwave or to find an outlet for a plug. Wouldn't it be great if you could walk into a room and the lights would automatically turn on and turn off when you left? How about the front hall light going on when coming in at night or the laundry room would light up when your hands are full of dirty clothes? Using motion detecting lights whether its light switches, stick up closet lights, this type of lighting is a convenient way to light up your way to prevent fumbling for switches when you enter a dark bathroom or hallway at night. Change out your near vision lighting to lamps that can be adjusted and directed onto your task and add additional light to dark areas such as under cabinets, near stairs or unlit corners of your house.